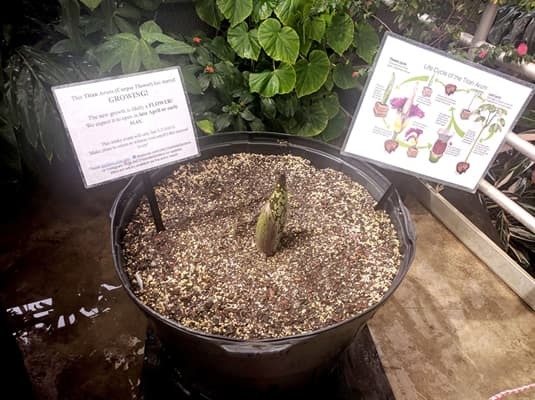 The burgeoning flower has emerged from the soil, and it is taking a shape of a blossom, according to Botanical Gardens staff members. Titan Arums are native only to the jungles of Sumatra and produce the world’s largest floral structures; they can grow to 10 feet in height. Titans normally open in the evening and the intense odor only lasts for 12 hours. The bloom will stay open (with a much lighter odor) for only one to two days.